We Heart Mac and Cheese: Voulez-vous coucher avec Mac? I read somewhere that Patti LaBelle’s macaroni and cheese is soooo delicious, it made Oprah cry. Being all in favor of making Oprah cry (I kid! Sort of…), I’ve had this one on my To-Do List for a long time, and the recent gloomy weather presented a perfect opportunity for some piping hot cheesy goodness. For a whole pound of pasta, it seems like this recipe doesn’t include nearly enough cheese (even when it is multiplied by a reflective shiny bowl!). But somehow it works. I guess the meltiness of one cup of Velveeta goes a long way. I’ve included the recipe just as I found it, but I do think it makes things sound unnecessarily rococo. I mean, why dirty a saucepan to melt a stick of butter when you could simply cut the butter into chunks, toss it into the just-drained pasta and stir? Instead of messing up a bowl only to combine the four shredded cheeses, why not grate them onto the same piece of waxed paper? I guess Patti has kitchen staff who do the clean-up. Me: not so much. And using some mild Cheddar and some sharp Cheddar seems a little nutty to me. You’re either in or you’re out. I went sharp, all the way. Even so, no single cheese note stood out in this dish, not even the Velveeta. 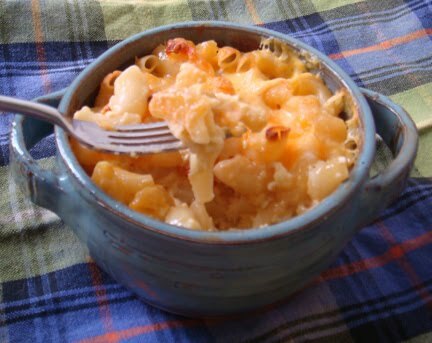 This mac has a generic, pleasant cheesy flavor but it doesn’t knock your socks off. This is not the most decadent, lush mac I’ve ever cooked, and I don’t see what Oprah got all choked up about, but let’s just say the leftovers won’t go to waste. It’s a perfectly satisfying (if ultimately underwhelming, given the Oprah buildup) representation of its genre. Bonus: Patti’s mac reheats quite well when a splash of milk is added. Preheat oven to 350 degrees. Butter a deep 2.5 quart casserole dish. Bring a large pot of salted water to a boil over high heat. Add the oil, then the macaroni. Cook about 7 minutes, just until the macaroni is tender. Drain well and return the cooked pasta to the cooking pot. In a small saucepan, melt 8 T butter. Stir into the cooked macaroni. 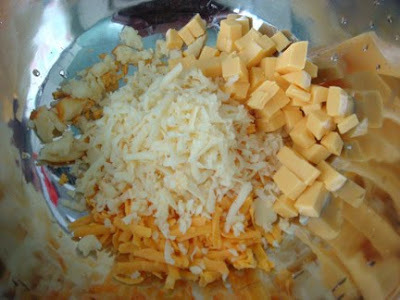 In a large bowl, combine the shredded cheeses. To the macaroni, add the half-and-half, ¾ of the shredded cheese mixture, all of the Velveeta, and the beaten eggs. Season with salt and pepper. Pour mixture into the prepared casserole dish and top with remaining shredded cheese. Dot with 1 T butter, if desired.